3D Modelling allows UK Precision to perform product design work quickly using ‘Solidworks’, the industry standard in 3D modelling software. We are able quickly and effectively to refine these models to our customers’ requirements, meaning that we can reduce the development time of new components for customer sign-off. This expertise enables us to convert the dimensional data into actual components without the need to use conventional programming methods. 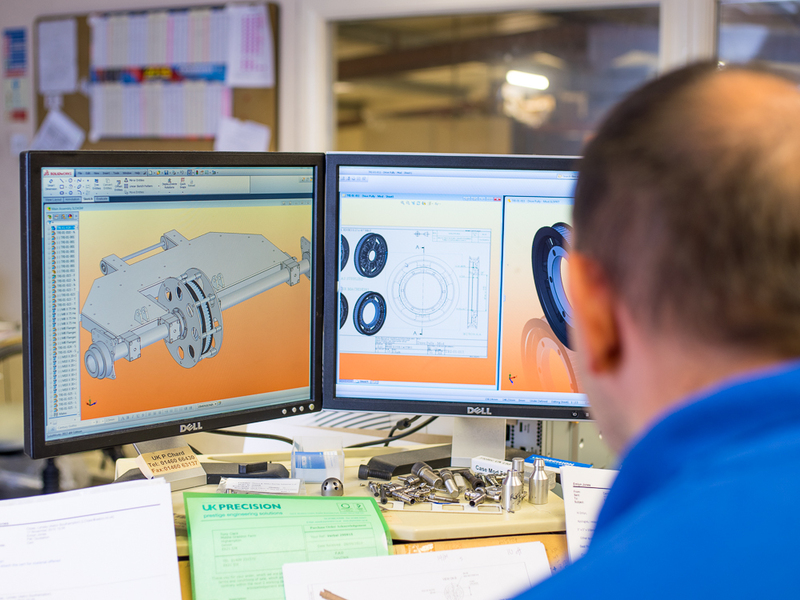 As standard, we adopt a Design for Manufacture approach which means that in the design stages, we always review customer part requirements to provide an optimum solution in the production cycle. This means that we are always able to offer cost-effective solutions to our customers. Models can be assembled and motion simulated, to ensure that individual milled and turned components have the necessary clearance and structure for optimum performance. This also allows our customers to see their parts in 3D as fully functioning and moving models, if required. By using our Edgecam and OneCNC software we have the ability to create CNC programs directly from these models. This eliminates any sketching or dimensional errors. Our customers are able to visualise the finished products and assemblies before we commence machining. Customers send us files in various formats to start the process, and we are always available to advise on the best way of communicating information to us. If required, we can provide a complete design service and generate component drawings for you. We have even developed drawings and the resulting components for customers where the start point was a gap between two existing parts – we love problem solving! We will always come back and question you if we are not clear about your requirements, and more importantly, we design for manufacture which means that we identify the most cost effective way of producing your components – ensuring that we keep your costs as low as possible. We can also help you work through concepts, giving you the benefit of our engineering knowledge. We work with you to identify the best material and production method for your requirements, and where possible, suggest design enhancements which will reduce costs. We are happy to try new methods and ways of doing things and are continually developing our knowledge base so that we give the best service possible. Prior to committing to manufacture, we can provide prototype components or the 3D model, to ensure that we have full customer sign-off before we commence batch manufacture. We are always on hand to help and advise post-delivery with any future requirements or design changes.